Wakey!Wakey!’s lead singer/piano player Mike Grubbs, who originally got his start playing a musician on One Tree Hill, has recently released his first full-length album, with bassist Anne Lieberwirth, violinist Patrick Doane and backing vocalist Tanya Buziak. 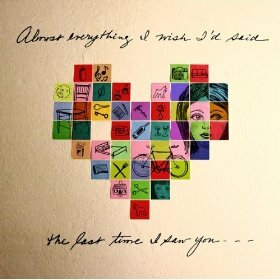 Almost Everything is an album that is chock-full of infectious, piano-laden melodies, with a dash of violin mixed in. Upon first listen, the band reminded me very much of Train, Vampire Weekend and Spoon, perhaps mixed together. The title track optimistically opens the album, while “The Oh Song” is addictive and probably the best track overall. “Dance so Good” is a song that you expect to pick up speed, but it refreshingly stays put; offering a romantically catchy sing-a-along, reminiscent of The Beatles. “Car Crash” is probably the most intense song melodically and lyrically, using a car wreck as a metaphor for lost love, while “Take It Like a Man” is an opera-like ballad which combines frenzied violin with calm piano. The latter track seems to be about two lovers; one fed up and wanting to leave and the other convincing them to stay. If looked at from this perspective, the rhythm of the song fits perfectly with the lyrics.